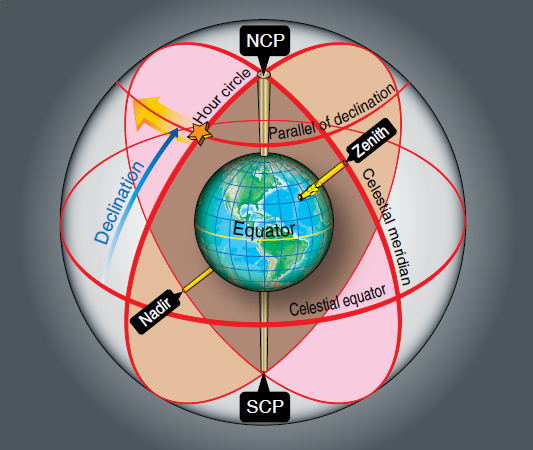 Celestial bodies and the observer’s zenith may be positioned on the celestial sphere using a coordinate system similar to that of the earth. Terrestrial lines of latitude correspond to celestial parallels of Dec. Lines of longitude establish the celestial meridians. The observer’s celestial meridian is a great circle containing the zenith, the nadir, and the celestial poles. [Figure 8-2] A line extended from the observer’s zenith, through the center of the earth, intersects the celestial sphere at the observer’s nadir, the point on the celestial sphere directly beneath the observer’s position. The poles divide the celestial meridians into upper and lower branches. The upper branch contains the observer’s zenith. The lower branch contains the nadir. Figure 8-2. 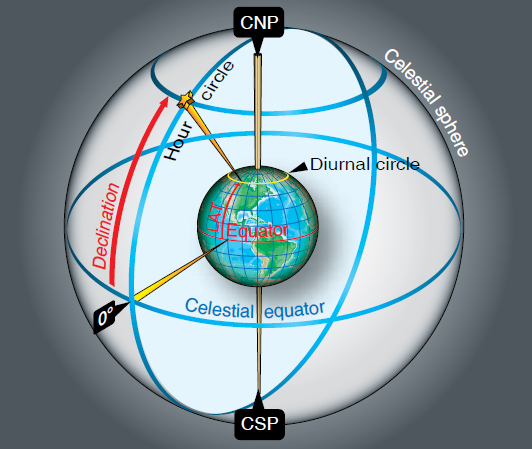 Elements of the celestial sphere. A second great circle on the celestial sphere is the hour circle. The hour circle contains the celestial body and the celestial poles. Unlike celestial meridians, which remain stationary, hour circles rotate 15° per hour. Hour circles also contain upper and lower branches. The upper branch contains the body. Again, the moon’s hour circle moves at a different rate. The subpoint is the point on the earth’s surface directly beneath the celestial body. You can locate any body on the celestial sphere relative to the celestial equator and the Greenwich meridian using Dec and Greenwich hour angle. 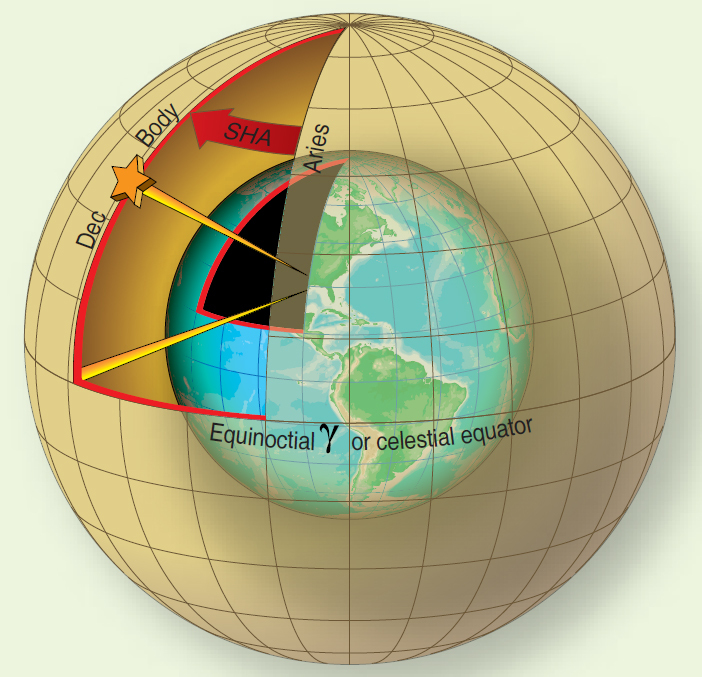 Dec is the angular distance a celestial body is north or south of the celestial equator measured along the hour circle. It ranges from 0° to 90° and corresponds to latitude. GHA is the angular distance measured westward from the Greenwich celestial meridian to the upper branch of the hour circle. It has a range of 0° to 360°. The Air Almanac lists the GHA and the Dec of the sun, moon, four planets, and Aries. The subpoint’s latitude matches its Dec, and its longitude correlates to its GHA, but not exactly. 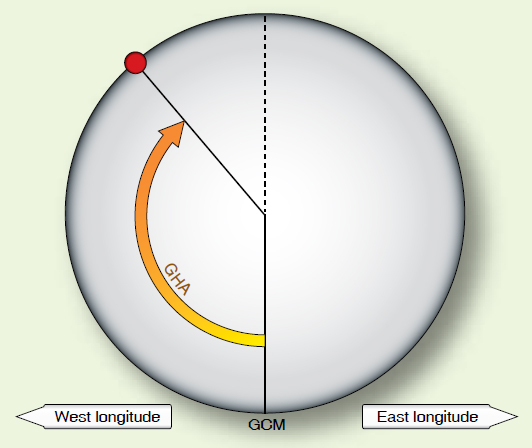 GHA is always measured westward from the Greenwich celestial meridian, and longitude is measured in the shortest direction from the Greenwich meridian to the observer’s meridian. Figure 8-6. Declination of a body corresponds to a parallel of latitude. You will use two other hour angles in celestial navigation in addition to GHA, local hour angle (LHA), and sidereal hour angle (SHA). [Figure 8-7] LHA is the angular distance from the observer’s celestial meridian clockwise to the hour circle. LHA is computed by applying the local longitude to the GHA of the body. 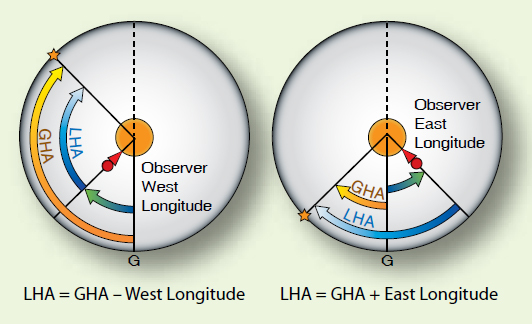 In the Western Hemisphere, LHA equals GHA – W Long, and in the Eastern Hemisphere, LHA equals GHA + E Long. [Figure 8-8] When the LHA is 0, the body’s hour circle and the upper branch of the observer’s celestial meridian are collocated, and the body is in transit. If the LHA is 180, the hour circle is coincident with the lower branch of the observer’s celestial meridian. SHA is used with the first point of Aries. The first point of Aries is the point where the sun appears to cross the celestial equator from south to north on the vernal equinox or first day of spring. Though not absolutely stationary relative to the stars, Aries moves so slowly that we consider it fixed on the celestial equator for as long as a year. The SHA is the angular measurement from the hour circle of Aries to the star’s hour circle. [Figure 8-9] Aries and the stars move together so the SHA remains constant for a year. Figure 8-7. Greenwich hour angle. Figure 8-8. Local hour angle. Figure 8-9. Sidereal hour angle.